The Ant & Mike Show - "We Do More Than Gossip": The Recession Hits The Movie Theater ?!? The Recession Hits The Movie Theater ?!? This week has been full of interesting developments for all you movie buffs out there. Advertising Age ran an enlightening piece on the looming surge in movie theater prices due to the increasing cost of popcorn. You read correctly. Popcorn is causing quite a stir in the movie industry right now. With the rising need for ethanol crops, popcorn crops will be cut, and concessions amount for as much as 45% of theater revenues. So what does that mean to us... a 30% hike in movie ticket costs! Surprisingly, 25% of ticket cost are subsidized in concession sales, so when popcorn costs rise, the ticket price has to rise as well. Mike Campbell, CEO of Regal Entertainment, the nation's largest theater chain, stated, "If we didn't charge as much for concessions as we did, the tickets to the movies would cost $20." Well, in my opinion, tickets will be mighty close to $20, if the price is going to be inflated by 30%!!! I do have some good news though! Netflix has announced this week that the company is gearing up to release a device, currently titled "Watch Instantly", that will allow for the high speed download of movie rentals directly to your T.V. set. 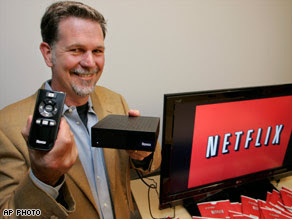 Similar to the functionality of Apple TV, the Netflix set-top box will work as a transmitter that will pick up a wireless internet signal and allow for unlimited downloads for a subscription fee of $9.99 per month. CNN details that the device will be priced at $99.99, significantly less than Apple TV which retails at $229. I definitely will be investing in this box once it is made available. The ability to rent movies for one flat rate a month and not have to drive to Blockbuster or mail DVD's back and forth is well worth the $100 bucks for the transmitter. What do y'all think - will you buy this? Does anyone already use Netflix? Will the rise in movie ticket prices influence your movie-going habits?